Here’s my list of 20 new Australian beers that I most enjoyed in 2018. While I obviously haven’t tried every new beer brewed this year, I’ve had a few, and these ones were my picks based on my tastes. I’ve sorted the list beers into four broad styles of dark, sour, hazy, and pale. I’m a big fan of dark beers, especially over the winter months and there was a range of excellent ones making an appearance this year, which I hope we’ll continue to see. Brewed especially for Good Beer Week this year in collaboration with top Melbourne coffee roasters, Axil, the combo of vanilla, chocolate, and coffee could have gotten messy but in the hands of one of Australia’s best brewers in Modus Operandi, it all came together just right. Great aroma and taste and the finish is dry enough to keep those sweeter elements in check. A little different to your typical dark beer. It presents a thinner body, has minimal head and is more funky than bitter on the finish while featuring a unique blend of Carman’s muesli, coffee beans and brettanomyces yeast. It rewards drinkers with a rich and satisfying taste. Mayday Hills was my favourite beer series this year. This was one of the highlights of GABS this year. A real decadent sipper of a beer with bountiful hazelnut flavours. I feel like if they had given this beer a funky name like Beergelico or something they might have even won the People’s Choice award. This was my favourite barrel-aged stout. Such a nice balance of whiskey, coffee and stout. All big flavours in their own right, a big brew like this can sway one way or the other too much but this one found the perfect blend for my tastes. Milo and weet-bix in a beer sounded like a novelty so I held off purchasing this one for a while. But that was a mistake. It was quite enjoyable, with a choc-malt hit but well-rounded flavours that made it easy to drink. Another good breakfast beer brewed this year. Sour beers open up an entirely new palette of potential flavours for brewers to work with and these guys took full advantage. From the sessionable canned sours to the complex barrel aged beers in bottles, these beers are unique, refreshing and (mostly) fruity. At the end of a night of drinking, I tried this beer and it shone with a rare beauty, light but complex, easy to drink but bright and flavoursome. Aged in French oak barrels imbued with brettanomyces yeast, this was top shelf stuff. Arguably the producer of Australia’s finest beers. All of their beers I tried this year were great and this one was memorable. A little more tart than the standard Gold but with a lovely peach fruit aspect to it. My favourite berliner weisse style beer this year, the cherry raspberry edition in particular, produced an awesome red colour and was very tart in a good way. The Torquay based brewer had one of the more creative ideas at GABS this year, to brew with snails and it actually worked really well with the salty gose style. It was refreshing, I enjoyed it, and it sure was unique. The use of a new experimental hop from Hop Products Australia and the citrus zing of the yuzu combined to make this a treat. I could have listed many of the Mayday Hills’ range here. Their Urban Ale, their first tinnie, saw drinkers clamouring and stores selling out across town. The citray sour is a bit more of a challenging taste with a real orange taste and an acidic sour twang but they got the mix just right and produced another stunner. I really loved this beer. I was taken aback by how vibrant the watermelon aspect of this is. It’s really fruit-forward and has a solid tart finish too. 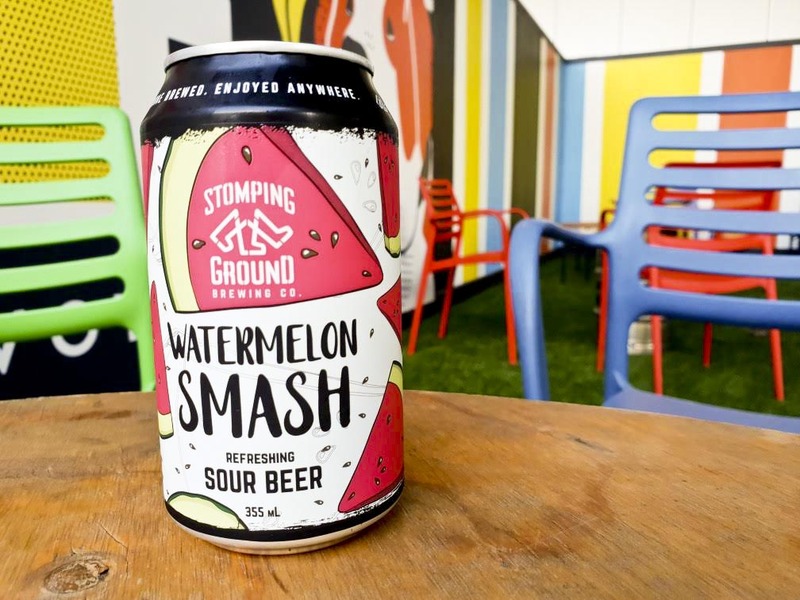 Stomping Ground’s forays into tinnies this year have been a stunning success. The last addition to this list, this session sour stout brewed with rosewater and blackberries was first brewed for the Heart of Tartness event at the iconic Scratch Bar in Brisbane. Really refreshing and easy to drink while offering plenty of flavour. It was a big year for New England style IPAs with just about every brewer seemingly giving them a crack. The novelty and hype hasn’t worn off yet for most, and there was a number of good ones. Sauce appeared to really put themselves on the map of good beer drinkers in Australia this year, winning plaudits with a wide range of canned releases and making it difficult to choose just one of their beers. This double NEIPA brewed for GABS was a big hot hoppy bomb with mangoes and a thick mouthfeel. It took the style to the extreme and did it justice. One of the better hazy beers this year using their signature rye malt and the addition of blood oranges to make a smooth juicy hoppy beer that hit the spot. Mornington Peninsula produced three Squid themed hazy IPAs this year and this one hit the mark for me. Sometimes NEIPAs can get a bit boozy or the hops can throw off some weird flavours but this one had none of that, it was a pleasant juicy drinking experience. The go-to beer style, it can be hard to impress drinkers these days with so many pale ale options out there, unless you do it really really well like these guys. The use of oak chips added a unique vanilla taste to the lovely tropical fruit aromas coming from the citra hops. Nomad released a range of variations of their Supersonic Double IPA beer and this one was the best in my opinion and my favourite IPA for the year with a refreshing unique citrus sing owing to the addition of Australian rainforest lime. I’d never heard of this fruit before but after drinking this I want to see it used more often. The hype was incredible. The beer was solid, in the best sense of the word. Balter just seem to do their beers to such a high quality. The Strong Pale Ale was also a top new beer but this one really captured the public’s imagination and had such a nice balance for a big hoppy beer. I enjoyed all the hoppy releases I tried from the Northern Beaches brewery this year. This one might have flown under the radar with so many other great releases but it was a really high quality hoppy beer, as I’ve come to expect from them. A hazy pale session that was oh so drinkable.